Oops - we don't appear to have a video for the fi-4120C2. We bought the Fujitsu Fi-4120C2 scanner and have been very impressed. It is fast, reliable, easy to use and great value for money. Overall, we feel that this is a great little scanner! 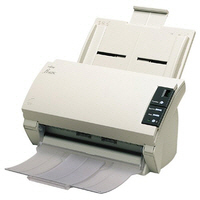 The Fujitsu Fi-4120C2 document management scanner offers high quality output resolution up to 600dpi. Control over error diffusion, colour dropout and gamma correction via the driver allows a wide variety of documents to be scanned. The user selectable black background enables the use of document deskew and autocropping of mixed document and high quality scanning of thin documents. With a slide away output tray the 4120 can be positioned near the users workstation for ease of use. When not in use the scanner reverts to a standby mode using only 6 watts of power. The Fi-4120C2 can accept a post imprinter unit to stamp the back each scanned document with up to 40 characters serving as further proof that all documents have been scanned.